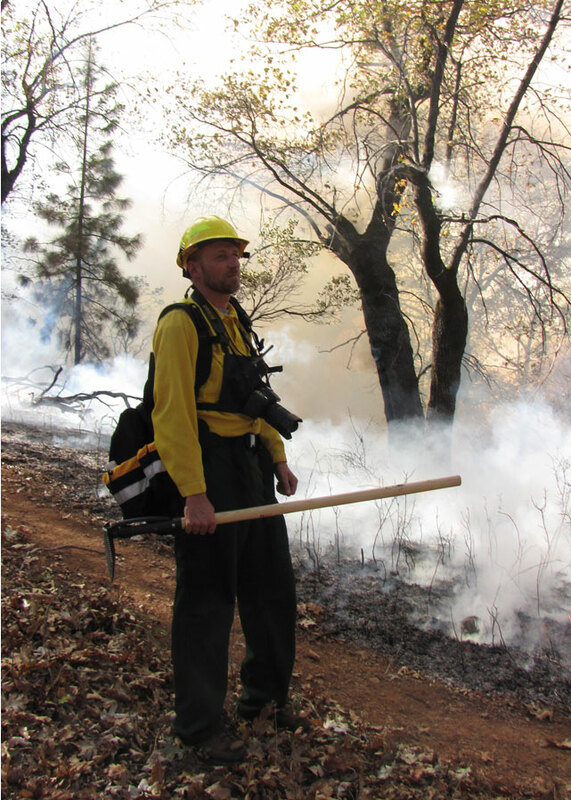 On a sunny day earlier this fall, about 50 Forest Service firefighters, mostly men, all wearing the Forest Service uniform of fire-resistant bright yellow shirts and fire-resistant dark green pants, are working a prescribed burn in the Shasta National Forest, near Redding, California. Setting fire to a forest actually requires many of the same tactics as putting one out. 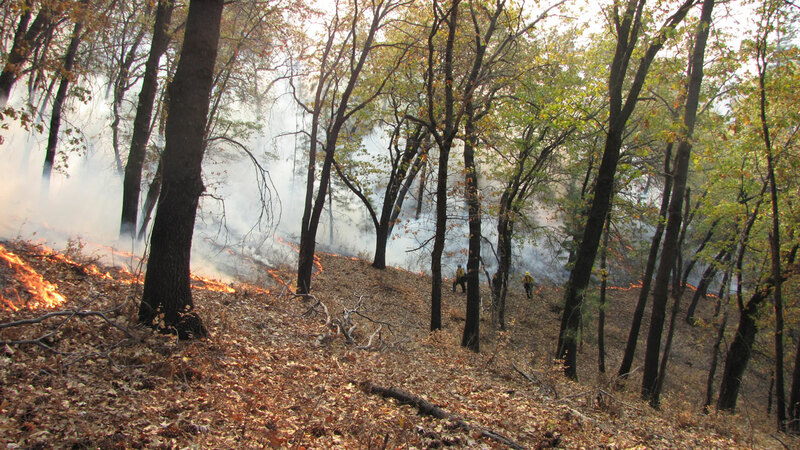 The crews are planning today to burn a slope near Shasta Lake, bordered on three sides by fire lines, and on the fourth by the lake itself. They had earlier cleared fire lines, strips without brush and leaves, that will contain the flames. As they begin their work this morning, they burn what they call "the black," an area ahead of and along the edges of the area to be burned that creates a safety zone for them and helps keep the fire from spreading. 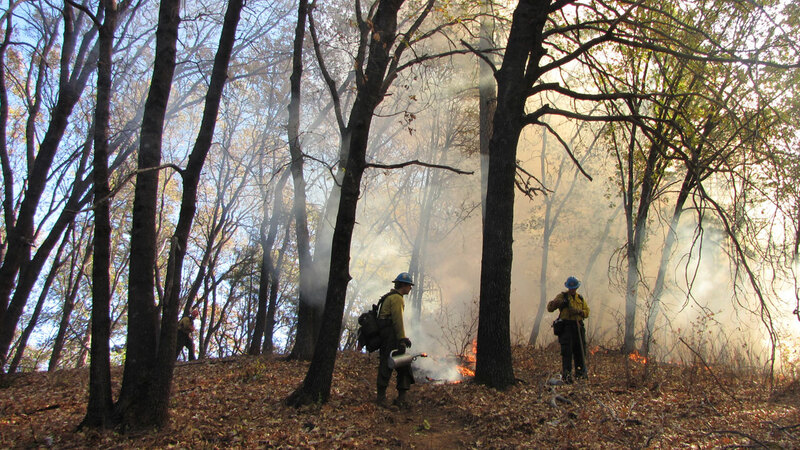 Then, beginning at the top of the ridge and working their way down (fire travels uphill, so this helps keep it in check), the crews set flame to dead leaves, and let the fire do its work. This is not a scene from "Bambi," with flames raging and animals fleeing. For the most part, the fire barely reaches a foot high. It kills bushes and smaller trees and clears out leaves and brush. But most of the bigger, older trees survive. Fires like this have, on occasion, gotten out of control and turned into wildfires in their own right. But this one is well under control. It's the end of the wildfire season, and the firefighters -- many of whom are on the elite hotshot teams that fight the biggest fires -- are relaxed while monitoring the flames, talking about their kids and their dogs. "I always like seeing fire on the ground," says Eric Knapp, an ecologist with the Forest Service. He says prescribed burns are good for the environment, for animals, for preventing massive wildfires and for keeping firefighters and the public safe. But getting them done is tricky. The window for conducting prescribed burns is narrow: when it’s dry enough that a fire will start, but not so dry that it will rage. "We have a limited opportunity to burn, maybe a week or two every year," says Knapp. "And (we have) a limited number of resources to get a lot of acres done." Often the people conducting the burns are seasonal firefighters, who are only budgeted for six months. "A lot of their seasons are spent dealing with wildfire during the hotter, drier times," says Knapp. In fact, at the Shasta burn, some of the firefighters are on the second-to-last day of their contracts. Then there’s the smoke. "It’s a carcinogen," Knapp acknowledges. "And there are people who are legitimately strongly affected." 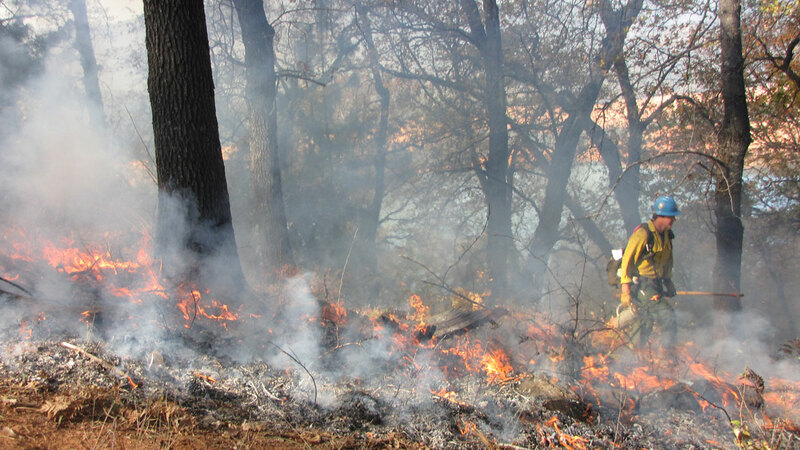 Because of that, regional air quality districts tightly regulate prescribed burns. Another burn, scheduled to take place near Redding on the same day we went to Shasta, was cancelled because of smoke. And sometimes it just comes down to a public relations issue. Not everyone sees the benefit of starting fires. "There’s a consensus among the scientists and the land managers," Knapp says. "I don’t believe there’s a consensus in the public." It’s like we’re losing the race, we’re just not losing it quite as fast. It all adds up to mean that not enough acres burn. "Every year we fall further behind and the fuel continues to build up," says Knapp. 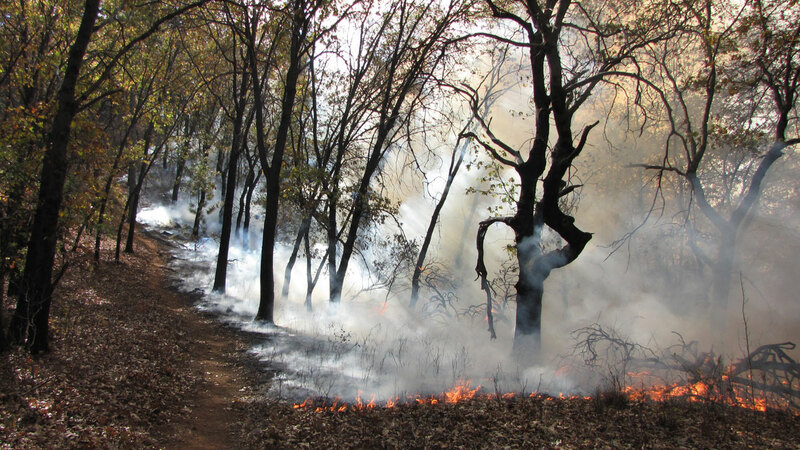 "If it weren't for prescribed burning, we'd fall behind even more. But it’s like we’re losing the race, we're just not losing it quite as fast." 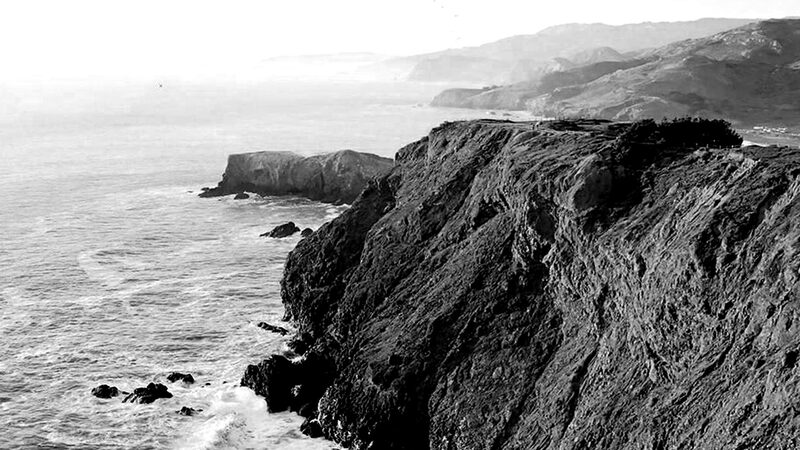 In California alone, about 15 million acres of forest are in need of some kind of treatment. "We’re in a huge deficit," says Scott Stephens, a fire scientist at University of California, Berkeley. Before the year 1800, he says, 4.5 million acres burned in California every year. Fires started either by Native Americans or by lightning were generally smaller and less intense, but much more frequent. Many areas burned every ten years or so. But because of aggressive fire suppression policies that managers followed for decades, many places haven’t burned in a century or more. Some forests are so overgrown, they have ten times the number of trees as they had historically. That's the difference between running through the trees, arms outstretched, maybe with a couple of friends by your side, and not being able to crawl through. Forests like these are more susceptible to giant wildfires, because there's more fuel to burn and it burns hotter. We’re carrying these forests that are incredibly vulnerable forward into climate change. It's a disaster really. "We’re carrying these forests that are incredibly vulnerable forward into climate change," says Stephens. "It's a disaster really." Because, he explains, California’s changing climate will make the fire season longer, and the prescribed-burn season shorter. Caught in the middle are the firefighting agencies, each with different approaches and priorities. The National Park Service and the Forest Service both have prescribed burn programs, but while the parks are concerned with conservation, the Forest Service must also take into account logging, and other land uses. The state agency, CalFire, has its own constraints, fighting many wildfires close to development in the "wildland-urban interface." This mingling of forest and residential areas makes prescribed burns still more difficult. 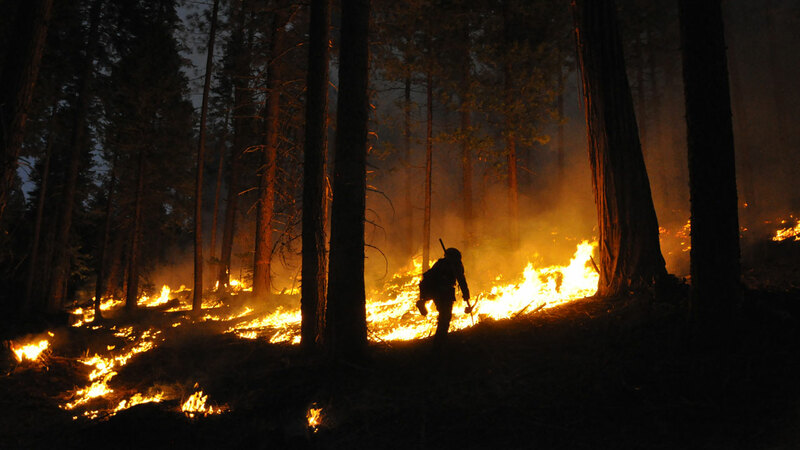 If this summer’s Rim Fire -- the largest known fire in the Sierra Nevada and the third-largest in California history -- is a lesson in the dangers of fire suppression, it also offers glimmers of hope about the benefits of prescribed burns. 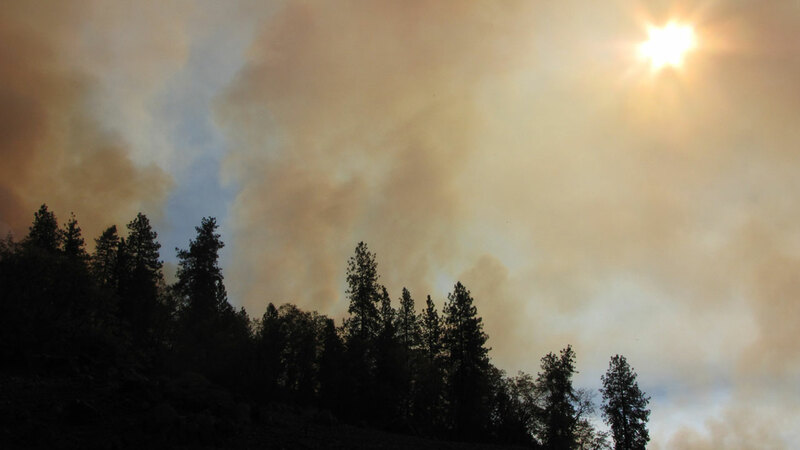 "Where I started my division assignment on the Rim Fire, was in areas where the Forest Service had recently completed some prescribed burns," says Tom Garcia, the fire manager at Whiskeytown National Recreation Area. "And we were able to stall that fire out in that particular area and buy some decision space and some time." With that extra time, Garcia says, they were able to get ahead of the fire, and save some nearby homes. "My real nightmare scenario is current conditions going forward," says Stephens. He says he hopes the Rim Fire will serve as a turning point: a glimpse of the path we’re on, and an opportunity to choose a different path that includes more thinning, more prescribed burns and more ability to manage and take advantage of fires that start naturally. A few of the National Forests in California are currently reviewing their management plans, and Stephens says he sees that as an opportunity to bring in more fire, too. "If we don’t do it now we’re going to set people up in the future for less decision space. They're going to have less options. It's going to be warmer. It's going to have longer drier periods," he says. "50 years from now, 80 years from now, they will just wish that we would have moved." Knapp, the Forest Service ecologist, says he’s optimistic about the future. But major wildfires will be a part of it. "We’re going to have to accept the fact that we live in an environment with occasional fire and that fire is more intense," he says. Because after a century of admonishments from Smokey Bear, even with the best efforts of firefighters, even with prescribed burns and logging and managed wildland fire, the era of catastrophic fires is upon us.